Should a church use a confession of faith? If so, how robust should that confession be? While few modern Baptists may be willing to identify with the Campbellite “no creed but Christ, no book but the Bible” approach to church life, considerably more seem to be skeptical of or even decidedly against the use of a robust confession of faith by local churches. Yet an extensive confession can serve a church well especially in seasons of doctrinal minimalism and confusion such as our own. All the modern hue and cry against dogma is really against morals. The more we reduce the number of the creed articles, the more we undermine practical religion. (3) the changed life resulting therefrom (Luke 1:75; 1 Peter 1:15). Then Jacob was a man of prayer-a man who wrestled, and groaned, and prayed. There is a man up yonder who never prayed this morning, before coming up to the house of God. Ah! you poor heathen don’t you prays No! he says “I never thought of such a thing- for years I have not prayed.” Well, I hope you may before you die. Live and die without prayer, and you will pray long enough when you get to hell. There is a woman: she did not pray this morning; she was so busy sending her children to the Sunday-school, she had no time to pray. No time to prays Had you time to dress? There is a time for every purpose under heaven, and if you had purposed to pray, you would have prayed. Sons of God cannot live without prayer. They are wrestling Jacobs. They are men in whom the Holy Ghost so works, that they can no more live without prayer than I can live without breathing. They must pray. Sirs, mark you, if you are living without prayer, you are living without Christ; and dying like that, your portion will be in the lake which burneth with fire. God redeem you, God rescue you from such a lot! But you who are “the sons of Jacob,” take comfort, for God is immutable. The Lord’s Day is a thoroughly up-to-date consideration of the Fourth Commandment and its ramifications for modern Christianity. 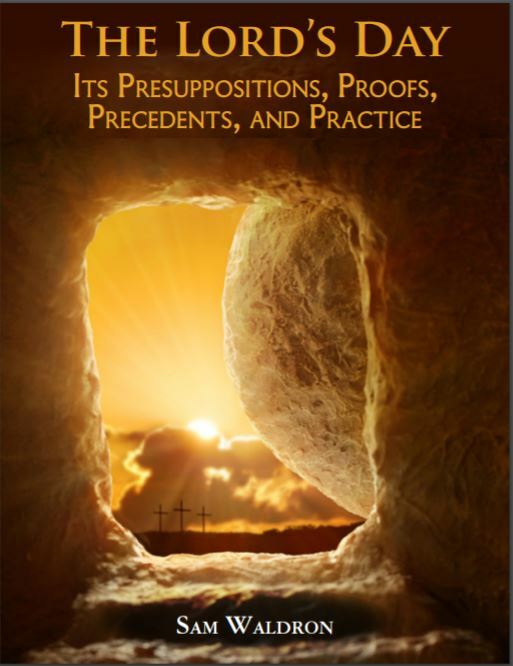 Its four sections include the Presuppositions that influence our thinking; Proofs at creation, by Moses, and in the New Testament; Precedents in the Apostolic Fathers and John Calvin; and finally its Practice. While precise and careful, the author avoids extremes and makes the nuances and complexities of the theological issues clear for most Christians. 3. Although all the power of the creature to act be from the Creator, and there is a providence of God always extended to every creature, and to every action of the creature; yet we judge that the sinful corruption of the creature, and the sinfulness of the creature’s action, is from the creature, and not from God: and that it is a greatsin to say that God is the author if sin: Eccles. 7:29; Habak. 1:13; James 1:13,14,15; I Cor. 14:33; I Jn. 2:16. As touching that place which is here objected against us, viz., Amos 3:6. Shall there be evil in a City, &c. We conceive that it is either to be rendered according to the last Translation in the margin, Shall there be evil in a City, and shall not the Lord do something? or else that it is to be understood only of the evil of punishment, and not of the evil of sin. Q.14: What are God’s works of providence?